Australian industry has developed a unique device capable of rapidly detecting homemade explosives, providing security agencies with a powerful tool against terrorism. 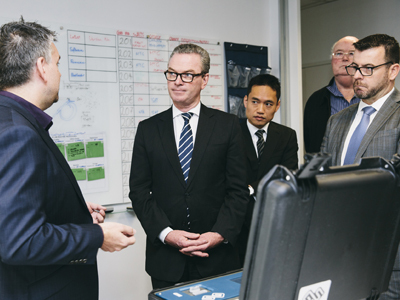 Minister for Defence, the Hon Christopher Pyne, launched a prototype of the Greyscan explosive detection device while visiting the Grey Innovation Group facilities in Melbourne. "I commend Grey Innovation Group on this pioneering product which will help make Australians safer. It is yet another example of Australian innovation delivering critical capability," Minister Pyne said. "This is an exciting technology which addresses the growing need for detection capabilities at high risk locations such as Defence and police facilities, cargo handling facilities, entry and exit points for large events and of course in the aviation market. The Greyscan technology was developed by the University of Tasmania and matured with funding from the National Security Science and Technology Centre which is now part of Defence Science and Technology. The United States Transport Security Administration is planning to trial the technology as part of its aviation security measures, recognising that inorganic explosives trace detection is a capability gap which the GreyScan technology fills.